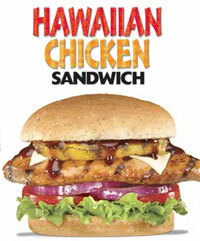 Hardee's introduced a new Hawaiian Chicken Sandwich this week. It consists of a charbroiled chicken breast with a teriyaki sauce and a slice of grilled pineapple, swiss cheese, red onion, tomato, lettuce and mayonnaise. There is currently a coupon on Hardee's website good for $1 off the Hawaiian Chicken Sandwich through November 11, 2007. The sandwich has 460 calories, 16 grams fat, 3 grams saturated fat, 75 mg cholesterol, 46 grams carbohydrates, 1130 mg sodium, 33 grams protein. If you must eat at Hardee's, this is one of the only semi-"healthy" choices- ask for NO MAYO to cut most of the fat and note very low sat fat - good dose of protein. It also tastes pretty good.